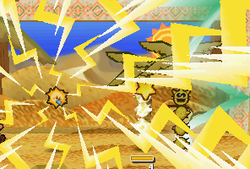 Mega Shock is an attack that Watt learned in Paper Mario. To acquire this move, the player must level Watt up to the Ultra Rank. The attack costs Mario five FP. To successfully execute this move the player must press the and buttons at the same time repeatedly. The attack, when performed correctly, makes all enemies become paralyzed, but does not cause damage. This page was last edited on July 26, 2018, at 08:42.